Bringing back a Salado favorite! Tues - Thurs: 4 p.m. to 9 p.m.
Fri - Sat: 4 p.m. to 10 p.m.
Sun: 10:30 a.m. to 2 p.m.
Alexander's Distillery was named after the distillery located on the grounds from 1861-1865, which washed away in a flood (historic marker located between the restaurant & The Manor). The newly renovated main bar is located on 1st floor, and opens onto expansive wrap-around, creekside porches. Just a few steps down from the porches is an open deck situated beneath gracious Live Oak canopies. 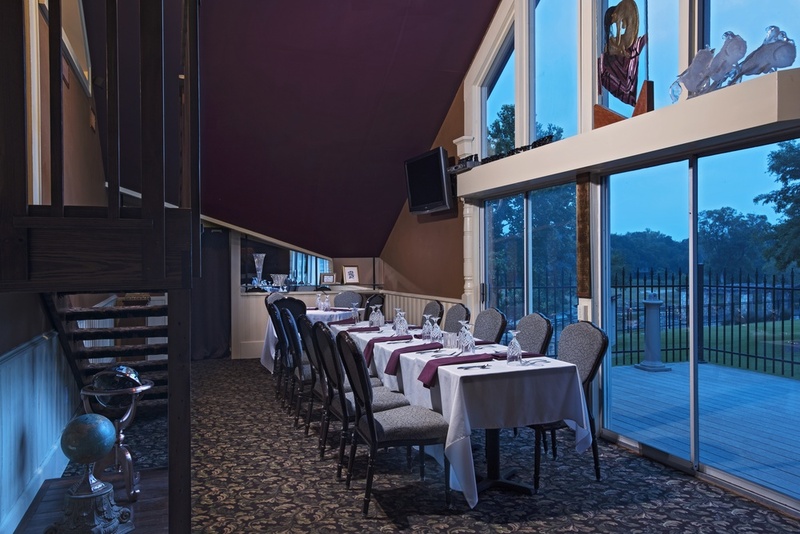 Patrons enjoy dinner seating in two, 1st floor dining rooms as well as two casual seating areas adjacent to the bar. A "speakeasy" style secret passage (yes! A secret passage!) allows entry to 2nd & 3rd floor private dining rooms each with it's own veranda overlooking the creek. These private areas behind the bookcase have been the backdrop for many-a-party. A 1920's themed celebration is shown here. The warm aubergine & copper walls of the upper floors contrast the amazing art representation from local galleries. The stunning view of Salado Creek as well as the grounds of the neighboring estate provide the perfect spot to enjoy your favorite beverage. Patrons choose from a variety of entree selections, appetizers, and adult beverages. Happy Hour: Everyday 4-6 p.m. Enjoy daily half-price appetizers and 30+ bottles of wine! Tuesday Prix Fixe: Visit Alexander's every Tuesday for Prix Fixe, a special Chef's choice entrée, dessert and wine pairing for only $14.95- an exceptional value you can't beat anywhere else! Our other on-site restaurant The Shed is open Sundays and Mondays! Check out their page for additional information and specific hours. The Shed provides a casual environment and great food & drink. At least ONE of our restaurants is open every night of the week!